We decided to give to try to VUEM onto one of ours envs to estimate the applicable users optimization. 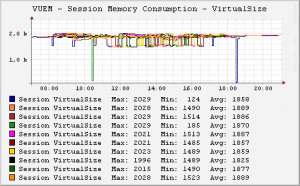 What do VUEM Memory optimization do ? To keep it simple, after an defined process idle time, VUEM ask to the OS to unload used memory onto swap space. 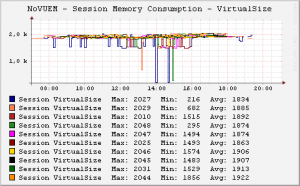 We monitor users sessions WorkingSet and VirtualSize. VirtualSize is the total memory allocated to a process (RAM+Swap) and WorkingSet is the usable part (RAM). Monitoring is done with powershell and WMI on a dedicated Citrix Serveur, we send measured value into a RRD. Sessions VirtualSize are gloablly the same on both servers. 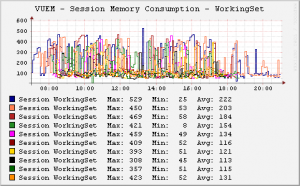 Lesser WorkingSet size on the server with VUEM, the effect is more evident if we stack them. And what about my servers ? The first consequence is an improvement of your servers abilities to host users. 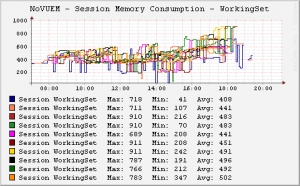 is making a preemptive swapping, active processes can have more available resources. In our test, we can improve hosting ability by more than 40%. 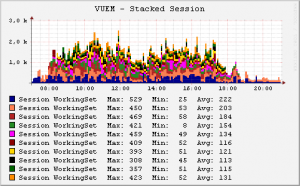 During the choosen day, the user load for server with VUEM was 40% higher. 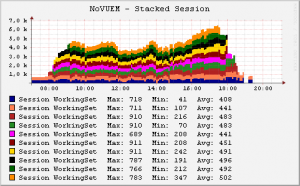 The server with VUEM filled his swap earlier and more rapidly, that allowed it to have more RAM available for active users, we were able to stack 40% more users with no “slowdown remarks” by users. The VUEM Effects?